The map that disproved the Northwest Passage. Cote Nord-Ouest de L'Amerique Reconnue par le Cape. Vancouver. VIIe Partie. One of the great navigator George Vancouver's most important and influential maps, this is Vancouver's 1799 mapping of Kodiak Island and Cook Inlet, Alaska. Centered on the entrance to Cook Inlet, this map covers from Knik Arm and Turnagain Arm southwards as far as the southernmost tip of Kodiak Island. Offers detailed topography throught with numous depth sounds and elevations rendered by profile. Mount St. Augustin and several volcanoes are noted. An inset of Port Chatham, at the southern tip of the Kenai Peninsula, appears in the upper left quadrant. One of the primary goals of Vancouver's 1793-4 expedition to American Northwest Coast was to resolve any doubt with regard the existence of a Northwest Passage. Following the Cook expeditions there remained but one possibility that might lead to the legendary water route – Cook Inlet, a large bay discovered, but never fully explored, by Captain James Cook in 1778. Vancouver's mission was to fully map Cook Inlet and determine if it did indeed connect to a watery network of rivers and lakes that could be used to cross the continent. Having skirted the eastern shore of Kodiak Island, Vancouver entered Cook Inlet in April of 1794. By May he had navigated the full extent of the Inlet, becoming the first european to visit the future site of Anchorage, Alaska. It was at this point that Vancouver's expedition reached its northernmost limit and turned around for the return trip to europe. This particular example of Vancouver's map was issued as plate no. 10 in the highly desirable 1799 French edition of Vancouver's Atlas. The rare and coveted French edition of Vancouver's Atlas is more beautifully produced with better engraving, higher quality paper, and more detail then the 1798 english edition. Rumsey 0233.011 (1828 reissue). Falk, M.W. 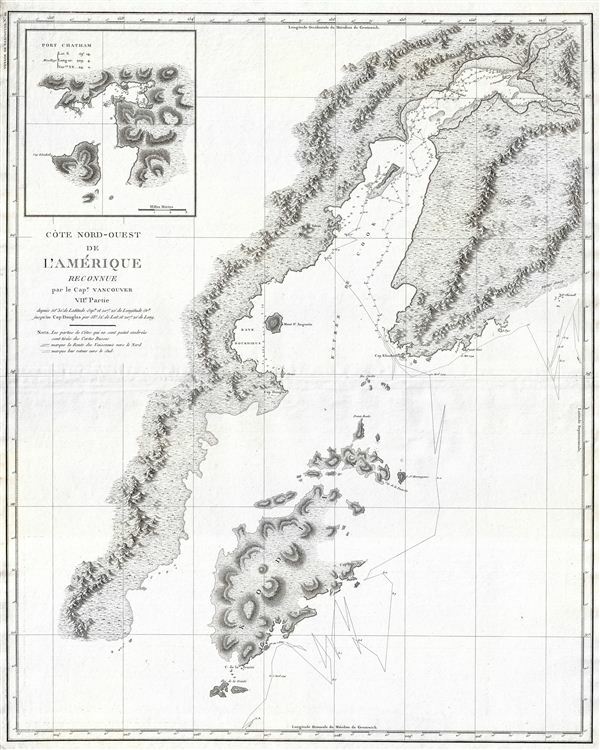 Alaskan Maps: A Cartobibliography of Alaska to 1900, 1799-7. National Maritime Museum. Catalogue, 256.